This is an interview with LUKE GRANT on radio station 2GB in Sydney and 4BC Brisbane on the 31st March the day after the death of Jade’s friend GEOFF HARVEY. 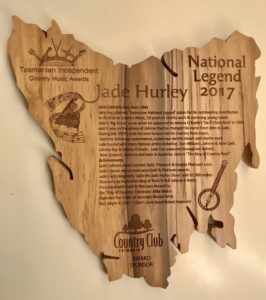 Jade was surprised and humbled with the presentation of the beautiful plaque recognising and acknowledging him as a NATIONAL LEGEND after performing at the invitation of the TASMANIAN INDEPENDENT COUNTRY MUSIC AWARDS at the Launceston Country Club on Saturday 21st October 2017. Jade has attained “Tasmanian National Legend” status for his outstanding contribution to Australian Country Music, 58 years of charity work & nurturing young talent. Jade’s “Big Break” came when he appeared on Johnny O’Keefe’s “Six O Clock Rock” in 1959 and it was on the advice of Johnny that he changed his name from John to Jade. During the 1970’s, Jade Became famous for his Country Rock Music, daytime television appearances, numerous variety shows and charity work. Jade toured with many famous artists including Don Williams, Johnny and June Carter Cash, Johnny Ray and Johnny O’Keefe. Jade has appeared throughout Ireland, New Zealand, America and here in Australia. Jade is “The King Of Country Rock”. Jade’s albums have reached GOLD, PLATINUM & DOUBLE PLATINUM sales. Jade’s music videos have won gold and Platinum awards. Jade’s autobiography “JADE – THE JADE HURLEY STORY” sold 32,000 copies. Discovery by Australian King of Rock N Roll Johnny O’Keefe. Presented with Gold and Platinum records by the “King of Daytime Television” Mike Walsh. Awarded the Order Of Australia Medal OAM. Six years in the making … 24 BRAND NEW RECORDINGS … Jade has finally completed his DREAM CD. After it was mastered at Sony DADC in Sydney by Mastering Engineer Toby Learmont, Jade said that he was ECSTATIC with the end result. Jade was sent a song which changed the whole concept and project. then, IN ONE TAKE, he recorded the vocal. REMARKABLY, the whole recording took 55 minutes from start to finish. Would you like to hear every track on the new “NAKED” CD? Three great Rockin’ Balladeers at their best Australia has had no shortage of Rock artists over the decades since the seminal Fifties, but few of the “belters” have been able, or had the opportunity, to serenade us with a good soulful ballad. The ballad is a change of genre and style that few can cross over from good rockin’ and master it. Three of our great Rock ‘n’ Rollers did and in the process made the sound their own. 1. I’m Counting On You – Johnny O’Keefe The father, now great grandfather, of Australian Rock ‘n’ Roll is often referred to as Australia’s Elvis. I like to think Elvis was America’s Johnny O’Keefe. O’Keefe could put over a song like no one else and rocked stadiums before stadium rock became a staple. His gruff belting voice dropped down to put over this beautiful ballad and synthesised rock and soul to infuse the track with a tender sincerity that remains the benchmark for Rock ballads. 2. Slippin’ Away – Max Merrit and the Meteors Not unlike O’Keefe, Merritt belted out good solid Rock but with a more raw and guttural delivery that produced a sound like a melodic Joe Cocker. Merritt, a one-eyed, imposing bear of a man was all muso and with Slippin’ away, lumbered into the genre and left this monumental track. The arrangement is brilliant and the delivery of the lyrics has a sincerity that still moves the listener no matter how many times it is heard. 3. How I Lied – Jade Hurley Still a premier country rock writer and performer, Hurley composed and recorded How I lied early in his career and it stands the test of time. It also stands as one of the great innovative tracks recorded here – or anywhere. A Rocker more than a belter, the piano playing Hurley can put over a song in any genre and with this track almost creates a genre of his own. Had this been recorded in the days of stadium rock it would have been seized upon by other artists and used as a show-stopper. Listen to How I lied and it’s not hard to imagine John Farnham or Queen really taking it out there. Just as it stands though, it is a marvellous country/rock/pop fusion masterpiece. These aren’t easy listening tracks – they compel one to listen closely and feel with them – the hallmark of a great ballad and a great balladeer. She said quote … “I have paid big money to see many international artists including Elton John and Billy Joel … but Jade Hurley is up there with them”. Jade commented that this was one of the nicest things said to him for a long time. Mrs Bishop arived at the Tamworth Country Music Festival the day before, saw Jade’s show advertised, went to the show that day … then drove back to Sydney the next day. 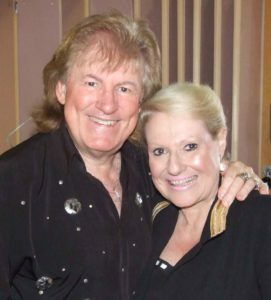 A HUGE endorsement for Australia’s greatest entertainment survivor … “Australia’s King of Country Rock” – JADE HURLEY.